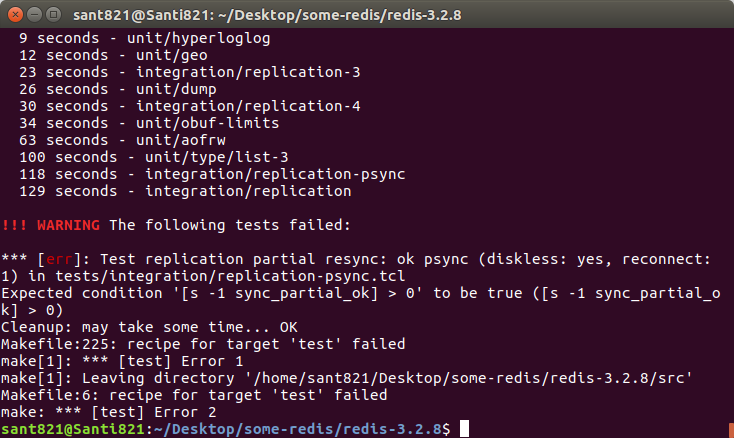 Every day I re-clone Redis' repo and run make; make test as a matter of habit. Hello, please try again, I was in the middle of doing changes. Are you still tinkering with it? Would you like me to test again in a couple of hours? I do not use replication. Probably due to slow instances or other issues I can't reproduce easily. If you have access to a system where the test fails consistently we can try a few things. I mailed to antirez with system access info. Thanks @open2, I may not be able to do this in the next two days (sat/sun), but monday morning I'll be on it. Today, the first time I re-cloned everything went fine, the second (for confirmation), the same error occurred again. Nevertheless, this is new: every day since I reported this issue, the tests were consistently failing, now I got at least one clear run. I don't know if this helps at all, but I'm willing to assist in any way that I can. On a VM running SMP Debian 3.16.7-ckt11-1+deb8u3 (2015-08-04) x86_64 GNU/Linux and under MacOS10.10.5 all test work fine. Same.. built from redis-3.0.5 -- repeatedly and consistently fails - on 3 different machines. Got the tests to pass only once. Sorry but can't replicate, @open2 provided my an SSH access that did not worked when I tried (temporary network issue I believe) and then I left for one week and forgot about the whole thing. So here we are again, how to replicate this easily? Is there a simple way in EC2 I can spin an instance and see the tests failing? Can you see if that fails to build? I don't have an EC2 instance handy but if it works for you I can make one. Ok, fails with a single client, your box is very fast, must be the exact environment than. I need to test with Debian 3.16.7-ckt11-1 specifically. I hope to find an image in EC2. Ran into same problem with stable version; so just Installed particular version http://download.redis.io/releases/redis-3.0.0.tar.gz and working fine now. I'm on a server with 6 cores CPU 3.5 GHZ and 16 GB RAM. Did the test remotely via SSH. So imho it looks to be some kind of race condition, which triggers if we have not small amount of parallelism on host machine. Anyone can give me instructions on how to reproduce with EC2 systematically? Exact Linux distro to install. I can fix it easily given that infos. @chilejiang1024 no.. this is just a false positive. Nothing will be affected. @antirez see #2715 (comment) to reproduce the symptom. @kerneljake The bug is time dependent, I already tested with different ubuntu versions locally and it does not happen easily, so I also need the right instance combination to test on the cloud. Thanks. @antirez I was able to reproduce it consistently in version 3.2.5 on c4.8xlarge running Ubuntu 16.04.1 LTS in EC2. @antirez It happens consistently on AWS ec2 c3.8xlarge (Ubuntu 15.04) which is a 36 vCPU system. Test: fix, hopefully, false PSYNC failure like in issue #2715. And many other related Github issues... all reporting the same problem. There was probably just not enough backlog in certain unlucky runs. Hopefully fixed, please try again with latest 3.2 branch commit, or cherry picking commit 6a33952 in your branch. Sure is working @antirez 😄 ok ok! @antirez, this change will be reflected on version 3.2.8 at redis.io? @sant123 not in 3.2.8 but in 3.2.9, the next version. 3.2.8 was already out before this fix was created. @sant123 you can simply apply the commit to the 3.2.8 source code if you can't wait, but I suggest using the latest 3.2 commit directly, since there are other fixes. Anyway 3.2.9 will be out in a couple of days hopefully. Test: fix, hopefully, false PSYNC failure like in issue antirez#2715. 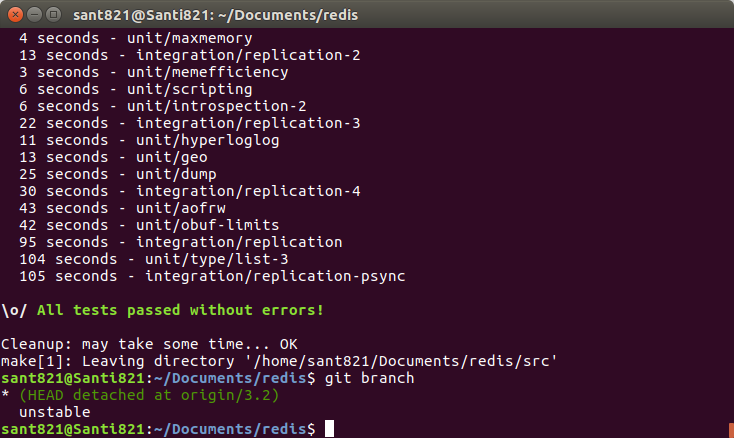 I am newbie in Redis, so what is "replication" in this context? Is it necessary? I found solution. taskset -c 0 make test is OK.
use version 3.0.6 and verify sha256sum.